Volunteers play a vital role in the Essex Child and Family Wellbeing Service. They perform essential, supportive tasks complementary to those undertaken by our paid staff. Their role is an enriching one, which benefits everybody: service users; staff; and the volunteers themselves. We simply couldn’t reach as many children, young people and their families without volunteers. 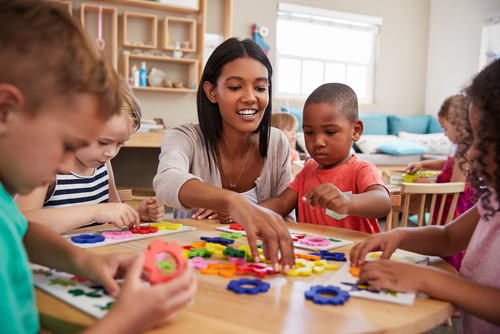 Virgin Care in partnership with Barnardo’s, delivers Essex Child and Family Wellbeing Service across Colchester, Tendring, Maldon, Chelmsford, Harlow, Loughton, Billericay and Basildon – to name a few. Services are delivered from purpose built Family Hubs, as well as Delivery Sites, community buildings, family homes and other convenient locations. Our volunteers support our vision across the service, guiding people to learn new skills, develop their existing experience and knowledge, improving their confidence and self-esteem while giving something back to the local community. We encourage our volunteers to have fun by doing something rewarding and enabling children and young people to have a better start in life. A volunteer role is an enriching one, which benefits everybody: users of our services, staff, donors and the volunteers themselves. We simply couldn’t reach as many children, young people and their families without volunteers. Q1. As a volunteer, who would I be employed by? 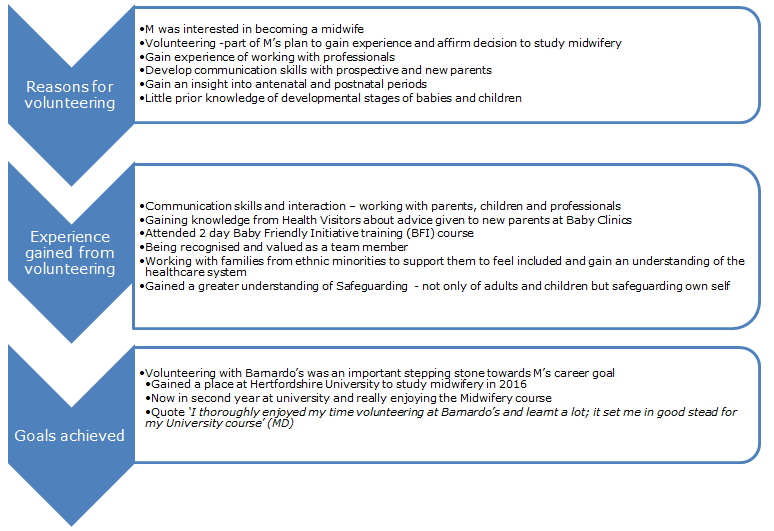 All Essex Child and Family Wellbeing Service volunteers are employed by Barnardo’s. Almost anyone! Barnardo’s is committed to ensuring equality of opportunity for everyone who wants to volunteer with us. Our volunteers include students, former Barnardo’s service users, job seekers, retired workers and full-time employees. All Barnardo’s staff and volunteers are expected to be committed to Barnardo’s Basis and Values and all our volunteers who will have contact with children and families are screened. Q3. How much time do I have to give as a volunteer? As much or as little as you want. Some people volunteer for a few hours every week, whilst others help out at one-off events or during school holidays. You can make an enquiry by emailing or phoning one of the volunteer coordinators using the contact details below, speaking to a member of staff or contacting one of the Family Hubs. Once the application form has been completed, one of our volunteer coordinators will contact you to arrange an informal interview. If successful, we will need to run a DBS (Disclosure and Barring Service) and reference checks (minimum of two). Once you have DBS clearance and satisfactory references have been returned, we will invite you to attend volunteer induction training where you will cover the necessary modules needed to volunteer within our service. Please be advised this process can take up to 4 – 12 weeks. There are a variety of roles available to volunteers across our Essex sites. If you think you have a particular skill or interest that could be used to benefit the families we support and the work we do, please get in touch. You can find a list of our locations here. There are many benefits to becoming a volunteer. All volunteers are offered full training and support, and an opportunity to develop new skills in a friendly environment. We offer opportunities for people to volunteer within the service, to help them on their journey towards becoming adoptive parents or taking on a foster carer role. As a volunteer you will be expected to adhere to the Barnardo’s organisational policies, just like any other member of staff. These policies are in place to ensure the safety and wellbeing of service users, staff and other volunteers. As part of the volunteer induction process, the following modules will be covered in the training you receive prior to your first session. We currently work Youth Enquiry Service, (CAVS) Castlepoint Association of Volunteers and Homestart. Working alongside other agencies may give our volunteers the chance to expand their skills if an opportunity arises.